Yes, America—there are still people who get out from behind their televisions and computers to build things and watch live entertainment. 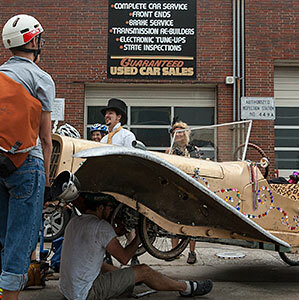 Few spectacles are as entertaining as the fourteenth running of the East Coast Championship Kinetic Sculpture Race. 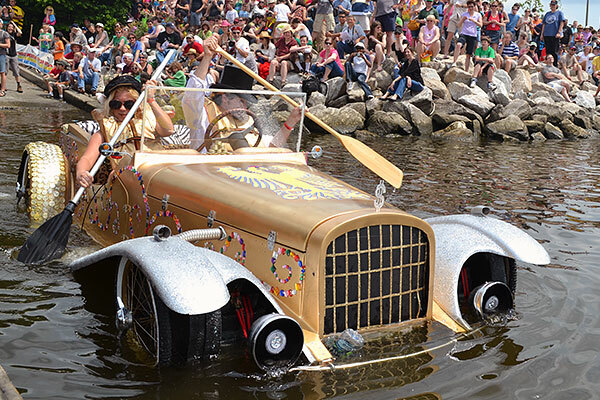 With 34 sculptures from 28 teams, the streets, parks, and harbor of Baltimore hosted the spectacular collision of art and engineering along the 14-mile race route. We’ll still finalizing our editing, so let us know about any errors or oversights. 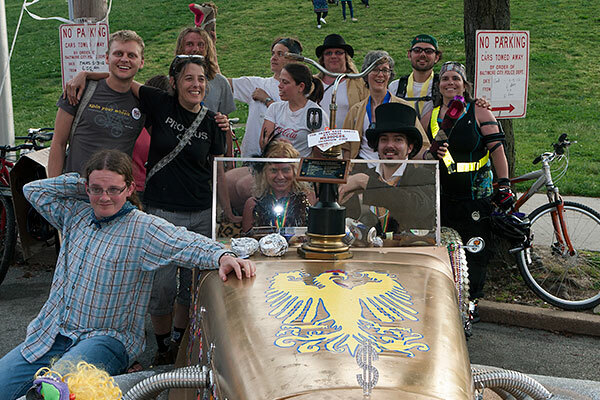 For capturing the zeitgeist of 2012 America in a highly capable kinetic craft, this new team was awarded the 2012 Grand Mediocre East Coast Championship. 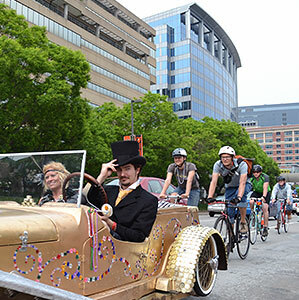 The 1% comes from Proteus Bicycles of College Park. 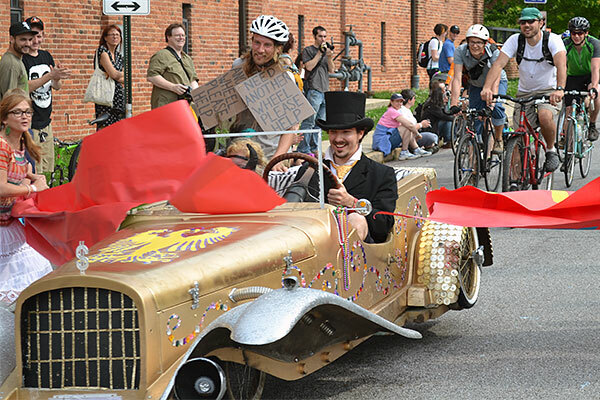 As is customary when a race starts, the preponderance of teams immediately fled. 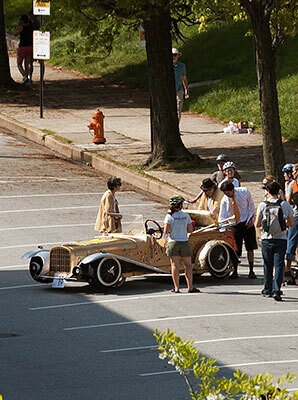 In their wake, two non-motile sculptures lingered in the empty AVAM parking lot. One was destined to become Grand Champion. 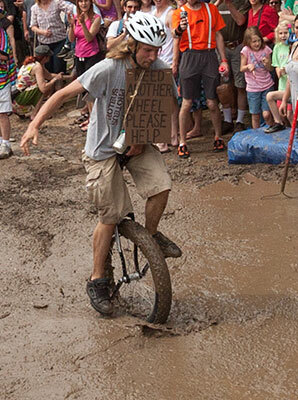 At the mud, their 99% unicyclist pit crew member miraculously passed through most of the inconsistently viscous goop before dismounting. 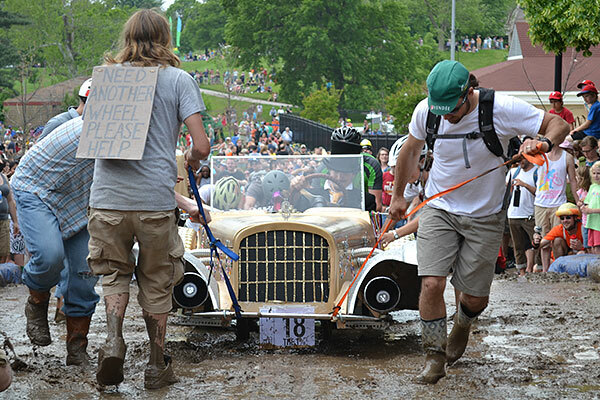 While crossing the mud without external assistance is required to ACE, it is not required for the championship. When The 1% needed repairs, they pulled into a service station where their vehicle was lifted (by their pit crew) and fixed. With gusto, they broke through the tape to finish.